Discover the secrets of a succeful awards submission. 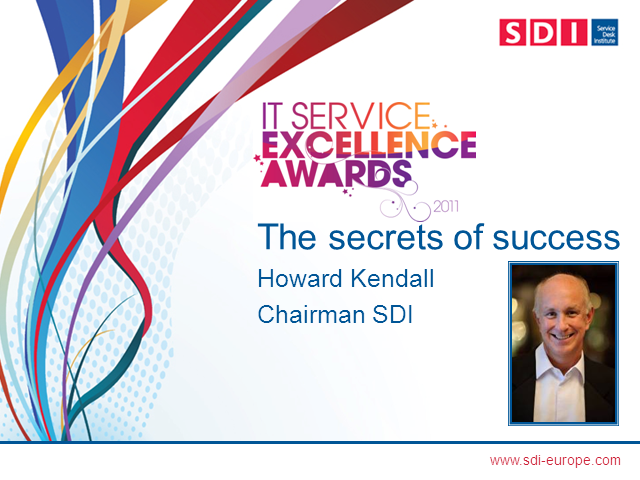 Howard Kendall, SDI's chairman, previous winners and this years judges share their experiences of what they will be looking for in a successful entry. Inspire, motivate and celebrate your IT service excellence and recognise your exemplary contribution to the profession. By competing with the very best from your industry category, the IT Service Excellence awards will celebrate your success and outstanding achievements. Winners know that their work has been evaluated by the sharpest IT service management minds in the business, and that their service has truly excelled. •The benefits to you and your team – inspire, motivate and celebrate!